For a project of this scope it was very disappointing to see Intel’s departure, only a few days before CES. I agree with CNET that this was handled poorly on both sides, and I’m especially concerned that Negroponte’s brilliant vision may ultimately get undermined by his in ability to compromise with the market forces that drive consumer electronics much more than altruism or societal need. That said it appeared that AMD remains solidly behind the project and many countries are buying in, so hopefully this will bring to pass the grand vision of technology to those who have the least chance of getting it otherwise – poor children in developing countries. My favorite project of CES remains the Meraki mesh networking concept. It’s a great example of leveraging existing technologies in new and clever ways while keeping common sense, profitability, and global citizenship in mind. 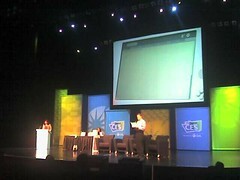 This entry was posted in CES, CES 2008, companies, computers and tagged CES, Intel, meraki, mesh networks, negroponte, One Laptop per child. Bookmark the permalink.